Morton neuroma is painful thickening of the tissue around one of the nerves in the foot. It can affect any of the toes in the foot. 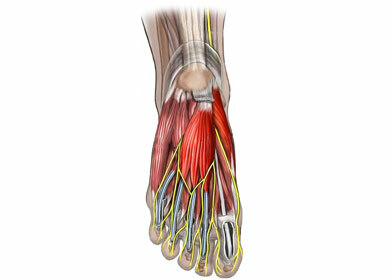 However, it most often affects the nerves that run between the third and fourth, or second and third toes. The thickening of the nerve caused by inflammation and the build up of fibrous tissue on the nerve's outer coating. This fibrous build-up is a reaction to the irritation resulting from nearby bones and ligaments rubbing against the nerves. It is unusual for more than one Morton neuroma to occur on one foot at the same time. It is rare for Morton neuroma to occur on both feet at the same time. The foot may be injected with corticosteroids mixed with a local anesthetic in order to reduce pain. Relief may be only temporary however, if the mechanical irritation is not corrected. Injections with other types of medications such as alcohol, phenol, or vitamin B12 are sometimes used. Avoid wearing tight and/or high-heeled shoes. Maintain or achieve ideal body weight. If you play sports, wear roomy, properly fitting athletic footwear. Clinical Practice Guideline Forefoot Disorders Panel, Thomas JL, Blitch EL 4th, Chaney DM, et al. Diagnosis and treatment of forefoot disorders. Section 3. Morton's intermetatarsal neuroma. J Foot Ankle Surg. 2009;48(2):251-256. Morton neuroma. EBSCO DynaMed Plus website. Available at: http://www.dynamed.com/topics/dmp~AN~T114041/Morton-neuroma . Updated June 8, 2016. Accessed September 5, 2017. Morton's neuroma (intermetatatarsal neuroma). Foot Health Facts—American College of Foot and Ankle Surgeons website. Available at: http://www.foothealthfacts.org/footankleinfo/mortons-neuroma.htm?terms=morton%27s%20neuroma. Accessed September 5, 2017. Thomson CE, Gibson JN, Martin D. Interventions for the treatment of Morton's neuroma. Cochrane Database of Sys Rev. 2004;(3):CD003118.